Shannon Christie: [while trying to persuade Joseph to come with her] When I saw that, I realized you could be very useful to me... you could be my serving boy! Back in Gone With the Wind Gerald O'Hara tried to tell Katie Scarlett the importance of the land, a lesson she took the entire film to learn. For Tom Cruise and Nicole Kidman it's the land, their own bit of land to work as they please and answer to no one. The story of Far and Away takes place in a very specific time period in the history of both Ireland and America. In Ireland the home rule movement had been dealt a stunning blow with the fall of Charles Stuart Parnell in scandal. Independence had been set back and the landlords were riding high, though not without opposition. Opposition in this case comes in the form of Tom Cruise and his family who are Irish tenant farmers about to be tossed off their land because they can't pay the exorbitant rents. Turns out the landlord's got a most fetching daughter in Nicole Kidman who's got her eye on the peasant lad. 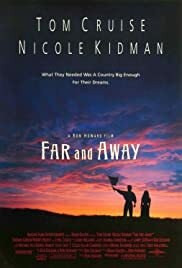 Far and Away is first and foremost a romance, the rich girl and the poor boy, two beautiful young people we all wish we were. Of course the real affair of Tom and Nicole and their eventual marriage is fairy tale storybook stuff on its own. It sure didn't hurt the film. They've got a rough road ahead though. In Boston they get exploited by their own people as badly as the English are doing in the old country. Of course their eventual salvation is the Oklahoma land rush where Tom can get his own land to work. Frederick Jackson Turner was a famous American historian who put forth the thesis that the reason America escaped the class struggles and revolutions of Europe was our frontier. It didn't work out so well for those Indians already there, but the proletarian masses instead of becoming a mob that agitators could stir to revolution just went west and made opportunities. Turner's thesis is still a widely respected paradigm in the study of American history and I think if he could have seen Far and Away, he'd say Ron Howard proved his point. Speaking of Ron Howard, it's pretty obvious he was influenced by both versions of the Oklahoma land rush previously made in the two films of Edna Ferber's classic Cimarron. He doesn't do badly in recreating Boston of the Gay Nineties and Ireland of the same period. And Tom and Nicole certainly look beautiful even when she's working in a factory and Tom's getting clobbered in a bare knuckle prize fight. Look for nice performances by Robert Prosky as Nicole's father, Thomas Gibson as Tom's rival for Nicole and Colm Meaney as the Irish political boss in Boston. Maybe the world needs a frontier to solve its problems.